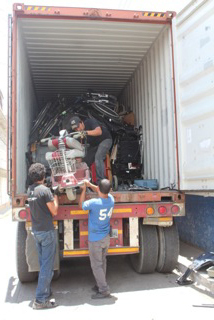 The container was loaded in Washington, Iowa on April 30th, and arrived in Chimaltenango, Guatemala on May 21st. Bethel Ministries International has been eagerly awaiting their arrival. 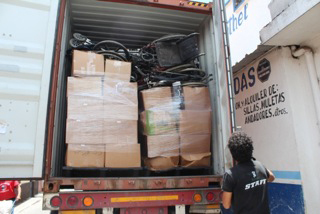 Once the container is unloaded, the Bethel wheelchair technicians will immediately begin to refurbish the chairs. There are many groups from the USA and Canada that are coming to work alongside Bethel this year to distribute these chairs to people who desperately need them. Mission : Mobility has groups in Kentucky, Pennsylvania, Iowa and other areas currently collecting chairs for their containers…and they need your help. 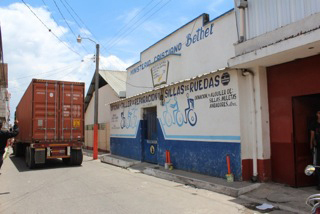 Please find the closest location to you and help collect chairs for Guatemala. This entry was posted in Uncategorized on May 28, 2014 by bclarkmission.